Has there been any movie genre more maligned recently than the studio comedy? Back in the day, movies with Eddie Murphy, Bill Murray, Chevy Chase and others were guaranteed to open to enormous business. They would stick around for quite a while and, if you didn’t like the looks of a particular one, no big deal. Another comedy would open soon. Things changed, and there’s a ruthlessly unfunny reason for that. Major studios don’t think regionally or nationally any longer, they think globally. Movie attendance in America has been steadily dropping, but attendance is huge elsewhere. The most profitable films? Action movies and animated films. It’s not because they’re stupid. It’s because they’re simple. These formulas cross cultural lines, so people from Singapore to Addis Ababa to Boulder can get behind the Hulk punching someone through a wall or Simba the lion singing. Remember that comedy doesn’t always lend itself to simplicity, since comedy is subjective. Comedy is different. What we find funny often depends on a shared perspective. Humor doesn’t always translate successfully between countries. The end result is American comedies go abroad and flop. Ergo, Hollywood is less willing to nurture quality funny movies. Against the odds, occasionally a quality studio comedy is released. Comedy breaks free. Comedy finds a way. When that happens, I think we’re obliged to support it. Besides, it’s a hell of a lot harder to make someone laugh in an original and inspired way than it is to make Oscar bait. Those reasons and more are why I loved Game Night. Their usual guests are the mostly-happily married Kevin (Lamorne Morris) and Michelle (Kylie Bunbury), and the sweetly dumb bro Ryan (Billy Magnussen) and his much smarter date Sarah (Sharon Horgan). Brooks (Kyle Chandler) is Max’s obnoxiously successful brother, and he delights in one-upping Max every chance he gets. They have a routine, one that involves playing games like Scrabble and Charades and drinking reasonably priced Chardonnay. Brooks wants to up the ante. He invites the group to his enormous home and announces a new game, one modeled on mystery dinner parties. Everybody is interested, and they’re even more interested when a pair of armed men break into the house, kick the crap out of Brooks, and proceed to kidnap him. The group loves the realism. Things get realer when they learn that Brooks will be killed if they don’t track down a Faberge egg and deliver it to a shadowy crime lord known as The Bulgarian. They split into pairs and attempt to get to the bottom of things in theirown way, all the while convinced that the increasingly dangerous mayhem taking place around them is simply staged. I’ll put this in the simplest way I know how. 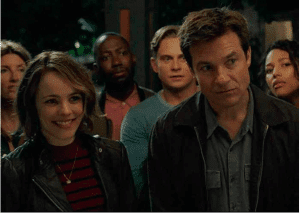 If you’ve seen the 1997 David Fincher film The Game, where uptight billionaire Michael Douglas is sadistically tortured by a company offering a kind of experiential live-action role playing game, Game Night is the funny version. Guys, I loved this movie. Absolutely adored it. On the rare occasion that we actually see a studio comedy, they aren’t usually examples of strong filmmaking. Sure, you might get something like This Is The End that’s simultaneously funny and well shot and edited. Too often, we’re stuck with something like Bad Grandpa that sets up a joke, executes the joke, gives us a wacky reaction shot from a character, and moves on. There’s no stakes, no edge in most studio comedies. Directors John Francis Daley and Jonathan Goldstein have cleared that hurdle with room to spare. They’ve made something that feels edgy and unpredictable, and it dances right up to the cliff of bad taste without going over. The script by Mark Perez is strong and structured cleverly. The characters aren’t just swept up in the narrative, they all have goals that pay off in clever ways. Possibly my favorite subplot involves Kevin obsessing over Michelle’s potential infidelity, and it’s wrapped up hilariously while staying in character. There are a few sentimental moments, but this isn’t one of those comedies that jettisons laughs in the last 10 minutes of the movie so that the main character can Learn A Lesson. Everybody in the cast knows what kind of comedy they’re in, and they work together to elevate each other. Nobody is obviously mugging to try and steal the spotlight from someone else. We’ve got a solid group of professionals at work here. Jason Bateman does his sarcastic suburbanite thing, and while he’s not reinventing the wheel, he does his job well. Rachel McAdams was criminally wasted in Doctor Strange, and as Annie, she makes up for it with a vengeance. She’s smart, sunny, perceptive, and totally willing to be ridiculous. She and Bateman also have comfortable chemistry together, and they feel like a couple that’s been together for years. The secret weapon of the film is Jesse Plemons as the unsettling Gary. He’s the next door neighbor to Annie and Max, a divorced cop obsessed with being re-invited back to game night. Gary frequently just appears, cradling a little white dog and seemingly going out of his way to make everyone feel profoundly uncomfortable. Plemons underplays the role skillfully, and he gets huge laughs by doing very little. If you’re reading this, I’m willing to make two predictions. The first is that you probably hold off on going to theaters except to see spectacle like Black Panther. The second is that you saw the trailer for Game Night, laughed, and figured you’d just catch it on Netflix. Do me a favor, please. Go to your local theater, buy your popcorn and 17-gallon sodas, and see Game Night theatrically. If it ends its theatrical run having made money, we’ll get more movies like it. Considering it’s one of the most delightful surprises of our young year, that’s a win. *It’s a nice change in a comedy to see a couple that actually has affection for each other, as opposed to seething contempt.